The Mapping Sculpture database is the outcome of a major three-year research programme. It delivers the results of the first comprehensive study of sculpture between the Great Exhibition of 1851, and the Festival of Britain in 1951. One of the goals of the project was to bring to light lesser known practitioners. 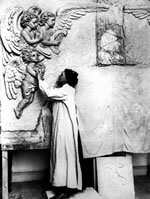 So the research has prioritised artists like Sophia Rosamond Praeger (1867-1954) and Percy Metcalfe (1895-1970) rather than adding to the existing knowledge base on well known sculptors like Alfred Gilbert (1854-1934), Jacob Epstein (1880-1959) and Henry Moore (1898-1986). Sophia Rosamond Praeger was a leading practitioner in Belfast around the turn of the last century. An important part of the Mapping Sculpture project has been revisiting the idea of sculpture as the product of a single artist working alone in the studio. ...plaster casters and stone carvers. 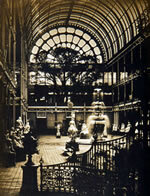 The project has made the first systematic record of a wide spectrum of sculpturally related businesses. This will allow the collaborative nature of sculpture to be more fully explored and understood. 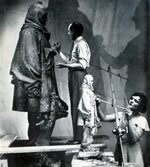 Sculptors often work to commission. Their patrons may be other artists, but are more often architects, or institutions, like the Art Union of London. To be successful a sculptor needs a network of personal and professional contacts. To uncover some of the ways in which these vital professional and personal connections were formed, Mapping Sculpture has documented attendance at art schools, clubs, and art societies, like the Art Workers Guild. 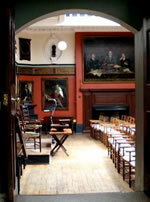 The Art Workers Guild was founded in 1884 and is a society of artists, craftsmen and designers. It was an important meeting place for sculptors and architects. 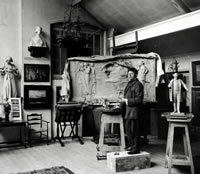 Between 1851 and 1951 sculptors created a wide variety of sculptural objects. These ranged from impressive public monuments like Eros to miniature sculptures on spoons. There were also major stylistic developments between 1851 and 1951 including, importantly, the emergence of modernism in the early 1900s. Mapping Sculpture has documented works in all these different forms and styles. 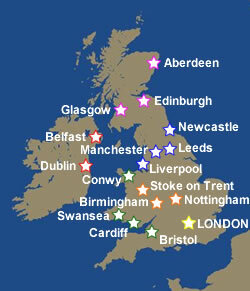 Sculptural activity across Britain and Ireland was transformed between 1851 and 1951 by urban expansion and the foundation of art schools, museums and art societies. These are a few examples of the institutions founded in different parts of the country. In order that the effects of these changes can be more fully understood the Mapping Sculpture research programme has taken place in seventeen cities around Britain and Ireland. The results of the research in all of these places have been entered into a central database. 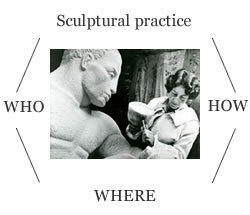 Mapping Sculpture can be summed up as an investigation of sculptural practice that aims to reveal the numerous personal and professional connections underlying the production of sculpture. The project's state of the art database provides the means of searching this complex web of connections. There are over 50,000 records in the database. This wealth of information can be used to answer many questions and will also suggest many new avenues for further investigation. Click here to see some examples of the many kinds of Searches you can do using the Mapping Sculpture database. Or if you want to read more about the research programme and how it was carried out click here. The project also received funding to create a mobile web interface. The mobile interface can be accessed here.